Labeled as a perennial prospect for much of his early career, Jacob Markstrom is finally living up to the hype as the Vancouver Canucks bonafide No. 1 goaltender. Last season, his fifth with the organization, the Swedish netminder played a career-high 60 games. These days he is backed up by another perennial prospect who is hoping to one day take his place in the Canucks crease. 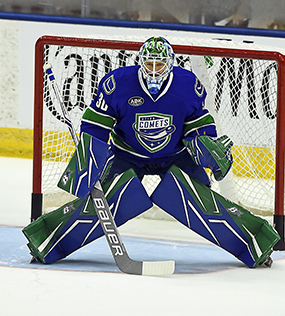 An early January trade that shipped backup goaltender Anders Nilsson to Ottawa opened the door for Thatcher Demko to step into the fold, the highly-touted prospect who has been marinating in the American Hockey League with the Utica Comets since 2016. 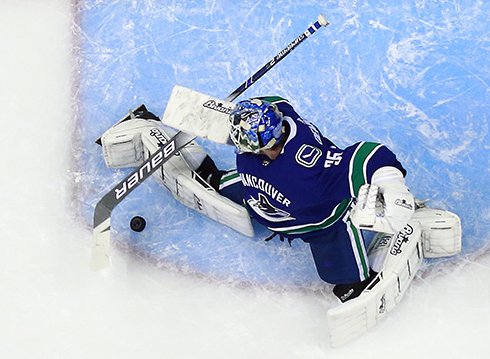 Demko has only appeared in one game since his Jan. 4 call up – a 36-save win over Buffalo on Jan. 18 – but the Canucks are trusting him to be reliable when called upon as Vancouver pushes for an unlikely playoff spot. If the 23-year-old’s resume is any indication, he’ll be up for the task when he does get the nod. A native of San Diego, Demko played his youth hockey with the San Diego Jr. Gulls before eventually making his way to play for USA Hockey’s National Team Development Program. The 6-foot-4, 192-pound netminder then starred at Boston College, where he was drafted 36th overall in the 2014 NHL Draft. The ensuing season he featured at the 2015 World Junior Championship with the U.S., then played 39 games his junior year with the Eagles, compiling a 1.88 goals-against average and .935 save percentage while winning the Mike Richter award as the NCAA’s top collegiate goalie. Demko has picked up plenty of seasoning in the AHL, appearing in 107 games over parts of the past three seasons. Coming on the heels of an AHL All-Star Game appearance in 2017-18, Demko has been knocking on the door of the NHL before a concussion suffered in training camp put him back in Utica to start the season. Similar to their approach with Markstrom, the Canucks have patiently allowed Demko time to develop his game. Much of that development is coming in practice-related situations, not the typical game workload. Still, he’s taking the approach that he needs to be ready when his time comes during the stretch run of the season. “It’s just treating practices like games, that’s the biggest thing. Just having that intensity in practice,” Demko said. Demko displayed some of those characteristics during his season debut, showing the skills that Canucks fans have been waiting to see. Demko not only has the size, but also an exceptional athleticism, that paired with his length and cross-crease lateral movement can make him tough to beat on most nights, even approaching elite status if everything pans out properly. Clark is tasked in helping Demko reach that status. After seven seasons in Columbus, Clark rejoined the Canucks organization where he helped nurture Roberto Luongo’s game. Now, his focus is on keeping Markstrom rolling while allowing his understudy to develop the tools needed to be successful at the highest level. Demko is maintaining a patient mindset and embracing the heavy practice-workload. While getting used to the NHL level and gaining experience is important, it’s a results-driven business and how Demko fares once he gets an opportunity to slide between the pipes will be the basis on which he’s judged. With every point important during the Canucks run toward a playoff spot in the crowded Western Conference, Demko knows that whenever he’s called upon he will be stepping into a high-pressure situation.